Capture the jewels of the night sky like never before with Nikon's first DSLR dedicated to long-exposure deep-sky astrophotography. Based on the award-winning full-frame D810, the D810A records the brilliant red tones of H-alpha emission nebulae with a level of detail and sharpness, wide dynamic range and rich tonality almost unimaginable until now. Reveal the faintest celestial objects with exposures up to 15 minutes long; and noise-free performance at ISO levels as high as 12,800 (expandable to 51,000). Create star trail images that span the entire sky with unlimited continuous JPEG shooting. Whether using a fixed tripod, equatorial mount, connected to a telescope or tethered to a laptop, the D810A can take your passion for the cosmos out of this world. 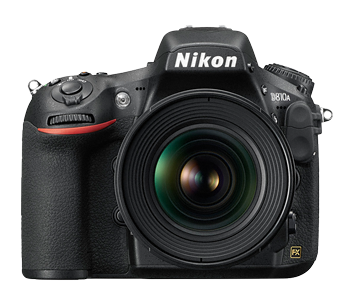 The D810A is designed exclusively for astrophotography—a first for Nikon models. Its IR filter is optimized for H-alpha red tones, resulting in four times greater sensitivity to the 656 nm wavelength than a standard DSLR. Celestial objects like emission nebulae can be captured in staggering detail by the 36.3-megapixel full-frame CMOS image sensor, which has no optical low-pass filter for even greater resolution. Capture views of the nighttime sky you may not have thought possible. Capture the faintest celestial objects with brilliant clarity. An electronic front curtain shutter eliminates internal vibrations—key for sharp long exposure images. Virtual Exposure Preview helps you frame and focus when in BULB or Time Mode, and the Long Exposure M Mode enables exposures up to 900 seconds (15 minutes). Nikon's free downloadable Capture NX-D software has an Astro Noise Reduction filter that eliminates pixel artifacts without sacrificing stars. Shoot an unlimited number of images when using the CH or CL Release Modes with a shutter speed slower than four seconds to produce beautiful light trails. Take up to 9,999 photos at any shutter speed with the Interval Timer and create smooth, even time-lapse sequences in-camera or in post production with optional third party software. A 12-bit uncompressed RAW size S* file size makes for faster image transfers and file management without sacrificing image quality. 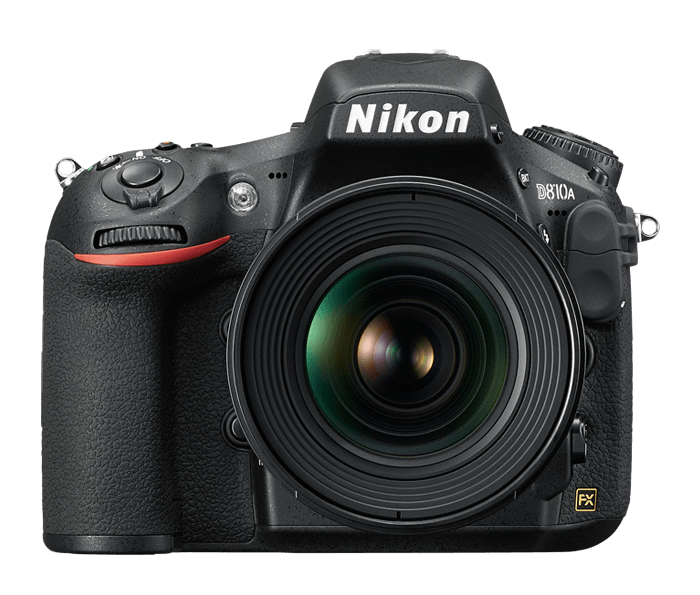 The D810A is designed to withstand the hardships of long-duration, high-volume outdoor shooting. Its shutter has been tested to 200,000 cycles, and its rugged magnesium alloy body has stringently tested weather and dust sealing. Add the optional battery pack/grip for greater comfort and extended shots per charge, and tether to a laptop with a high-speed USB 3.0 connection. Every superb NIKKOR lens helps you tell a new story with the D810A. From fast wide-angle prime lenses for expansive star trail images to super telephoto lenses for constellations and distant galaxies, you can always expand your capabilities and creativity. Add a wireless remote control or cable release, GPS unit, wireless transmitter and so much more. The image sensor in the D810A is optimized specifically for astrophotography. Its specialized image sensor is four times more sensitive to H-alpha red tones than an ordinary DSLR. As such, it is not suitable for general photography. AF NIKKOR lenses, including type G, E, and D lenses (some restrictions apply to PC lenses) and DX lenses (using DX 24 x 16 1.5x image area), AI-P NIKKOR lenses, and non-CPU AI lenses (exposure modes G and H only).